In March 1946, just after the war, Hattori Botanical Laboratory was founded in a small and quiet town, Nichinan, located in southern Kyushu. Supported by a private foundation based on the property of the late Mr. Shinji Hattori, the foundation is managed by income chiefly from rather extensive Cryptomeria japonica plantations and other assets derived from it. Since 1948 it is also assisted by subsidies from the Ministry of Education (now Ministry of Education, Science, Sports and Culture) of Japan. 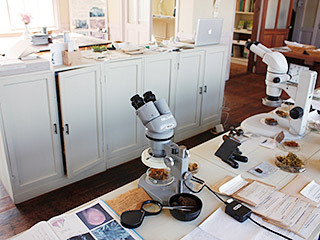 From the beginning, the work of the staff members of the laboratory has been devoted to bryology, but later a lichenologist was added. In 1972, the following staff members were engaged in the study of the taxonomy and ecology of Asiatic bryophytes and lichens: Dr. Sinske Hattori, Director (Hepaticae); Dr. Zennoske Iwatsuki, Assistant Director (Musci); Dr. Masami Mizutani (Hepaticae); and Dr. Isao Yoshimura (Lichens). A number of Japanese bryologists cooperate as research associates: Dr. Akira Noguchi, Kumamoto Univ. (Musci); Dr. Noriwo Takaki, Nagoya Univ. (Musci); Dr. Tairoku Amakawa, Shuyukan High School (Hepat­icae); Dr. Hiroshi Inoue, National Science Museum, Tokyo (Hepaticae); and Dr. Naofumi Kitagawa, Nara Kyoiku Univ. (Hepaticae). The main research projects of the staff members and research associates of the laboratory have been concentrated on the taxonomy of those Japanese bryophytes of which knowledge was incomplete and of which a thorough revision was neces­sary. Many families of Japanese bryophytes have been critically revised and the results have been published in the Journal of the Hattori Botanical Laboratory. From 1963, the laboratory has sent its staff members to circum-pacific areas, including: North Borneo, Taiwan, India, the Philippines, North and Central America, Alaska, and East Nepal. Accumulation of the numerous collections from these areas has accelerated studies in the taxonomy and distribution of bryophytes and lichens in these areas. Including the above-mentioned collections the laboratory has accumulated the following number of specimens up to March 2002. These collections are housed in 5 buildings. Space for research is offered to visiting scientists from other institutions. Publishing the Journal of the Hattori Botanical Laboratory is one of the major activities of the laboratory. (Nrs. 1-3 appeared under the name: The Journal of the Hattori Syokubutu Kenkyusho). 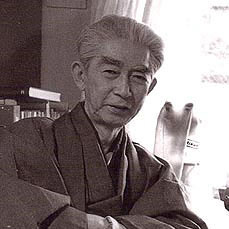 From the beginning Dr. S. Hattori has been the editor, assisted by the associate editors Dr. Leo F. Koch for numbers 20-23 (1958-60) and Dr. Aaron J. Sharp from no. 24 (1961) After Dr. Hattori passed away in 1992, Dr. Z. Iwatsuki has been editing the journal. The journal appears biannually since 1976. 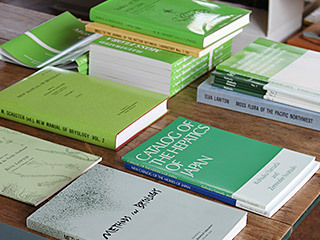 In earlier numbers, the articles were chiefly written in Japanese, but soon a great number of articles were published in other languages, especially English. The journal includes the contributions of staff members and research associates of the laboratory, but a number of articles by other bryologists and lichenologlsts have also been accepted. In addition to the journal the laboratory published Miscellanea Bryologica et Lichenologica (vol. 1, no. 1, 1955－ vol. 9, no. 9, 1983). This quarterly, small periodical primarily in Japanese, has serv­ed as an organ for short or quick reports, articles for amateurs, and news in bryology and lichenology. The editors were Dr. Masami Sato (lichenology) and Dr. Akira Noguchi (bryology). Musci Japonici Exsiccati, Ser. 1 (1947) – 34 (1983). Hepaticae Japonicae Exsiccatae, Ser. 1 (1946) – 22 (1982). Algae Aquae Japonicae, Ser. 1 (1949) – 3 (1953). Lichenes Japonici Exsiccati, Ser. 1 – 2 (1972). Bryophyta Exsiccata, Fasc. 1(1977) – 4(1983).